In the Heart of Speyside, between the barley fields and the foothills of the Grampian Mountains, lies this famous Scottish distillery. As for all great distilleries they use mostly, if not exclusively, resources that are locally available. The grains used for production grow all around the distillery and the water is drawn through the rocks from deep below. This 10YO has all of the characteristics you’d expect from a classic Speyside Whisky. Spending time in a combination of ex-bourbon and ex-sherry casks, this single malt is teeming with vibrant fruit-filled flavors, and warm notes of oak spices and green apple as well as the signature peach and apricot flavors characteristic of BenRiach. But it doesn’t stop there, this delectable Whisky also features notes of banana, with a hint of aniseed, lemon zest, and barley. An incredible orchestra of flavors, this 10YO has a depth and complexity you might not expect from a dram its age. So be a dear, treat your tongue. 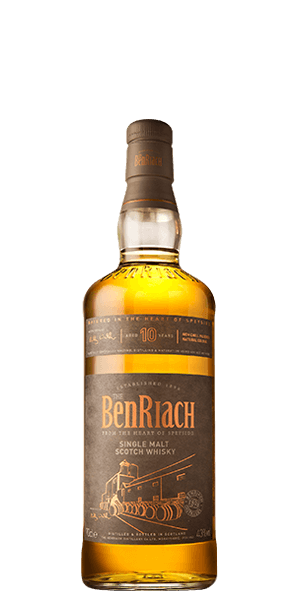 What does BenRiach 10 Year Old taste like? The Flavour Spiral™ shows the most common flavours that you'll taste in BenRiach 10 Year Old and gives you a chance to have a taste of it before actually tasting it. Crisp, green orchard fruits, stem ginger and hints of tangerine mellows to creamy vanilla with a delicate note of mint and a gentle twist of citrus, all held together with a sweet barley back note. Warm toasted oak spices, green apples and dried apricots, ripening to hints of peach and soft banana with subtle touches of aniseed and lemon zest. Long and crisp, with notes of barley. Smoke and vanilla, dry nice finish!! Nice smoke in the nose. Vanilla and fruit up front with smoke quickly following and a dry oak finish. Not complex, has some heat. Enjoy a tasty campfire in your mouth! Price point is high. Shop around. Remarkably balanced - and I say that in the best possible spirit. Slightly oily/creamy mouthfeel; sweet on the front, savoury on the back. Medium finish and mild heat - nothing overwhelming. Really benefits from judgement over time: let it sit for a bit and sip slowly. Very smooth and had a nice finish. My husband liked it better than his current brand. First scotch purchase, and was not disappointed. Smoother than expected and the taste was great. Incredibly smooth. Apple flavor with hints of smoke really make for a great single malt. Wife bought me a bottle in NYC a few months back and I finally got around to opening it. After tasting it for the first time, not sure why I waited so long. Outstanding flavor, character, and depth. One of the best values out there for an outstanding dram at at great price. Get it while you can would be my advice.